Most home buyers will view houses online before viewing a home. Matterport 3D brings listings to life. Buyers are 95% more likely to call and are up to 300% more engaged. As an agent or broker, you know buying a home is often more than a financial decision, it’s an emotional one. Matterport 3D scans create an immersive experience, beyond the standard photo galleries and 360° virtual tour. Home buyers actually move through the property with Matterport 3D. It’s as if they are doing a walk-through. More complete visual real estate marketing than photos alone. No other camera can create a stunning Dollhouse view on-demand. Home buyers can truly feel they are exploring the entire house from all angles. Our efforts have found that the 3D Dollhouse produces the most engagement and traffic. And the Dollhouse visuals are hi-res and print ready. Not only does Matterport 3D take photos and create an immersive 3D experience, it takes dimensional data. 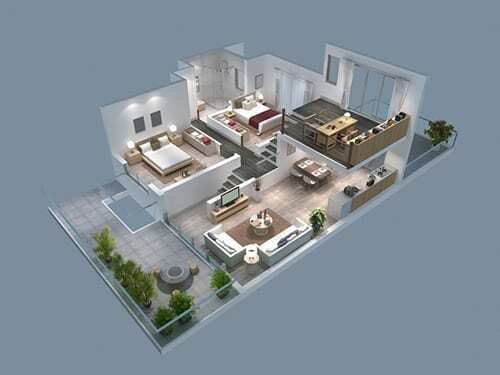 And generates a 2D black-and-white floor plan. A bonus for home buyers that want to map out the design layout before they move in. They can know if their furniture will fit. Get the listing. Impress potential sellers with how their home will show online with Matterport 3D. Hire a Circleshots photographer. A photo shoot can be completed in a few hours. Add to your listing. Hosted in the cloud, you can add a syndication link to your MLS listing or embed the video on your own site. A Circleshots photographer can scan a property quickly with minimum set-up. Matterport is more than a camera. It’s a completely automated system. Once the file is sent to you, it’s easy to update your listing. Embed the listing, Matterport is compatible with most website, including WordPress. Add to the MLS listing. Syndicate your Matterport where your listings normally would appear. Socialize the link. View in virtual reality. You can also download 2D photos for flyers and on the web. Add a black and white floor plan with a click. Find our more how Circleshots can help you use Matterport as your all-in-one real estate digital marketing solution.